To supply all of the dining outlets on a cruise ship and feed thousands of people each day requires a lot of food. The ship's executive chef cannot simply write out a shopping list and send a few waiters down to the local grocery store in each port of call. “To provide food for our customers, all the food needs to be approved by the [public health] authorities. [Therefore,] you need to have a source approved by public health.” For this reason, Princess has contracts with certain vendors. This also ensures that the food will meet Princess' standards and that Princess will have an adequate supply of the food that it needs. Most of the food comes from the United States. This is so even when the cruise takes place outside the United States. Above: Each evening, examples of all the items that will be on the menu that night in the main dining rooms are prepared for inspection. 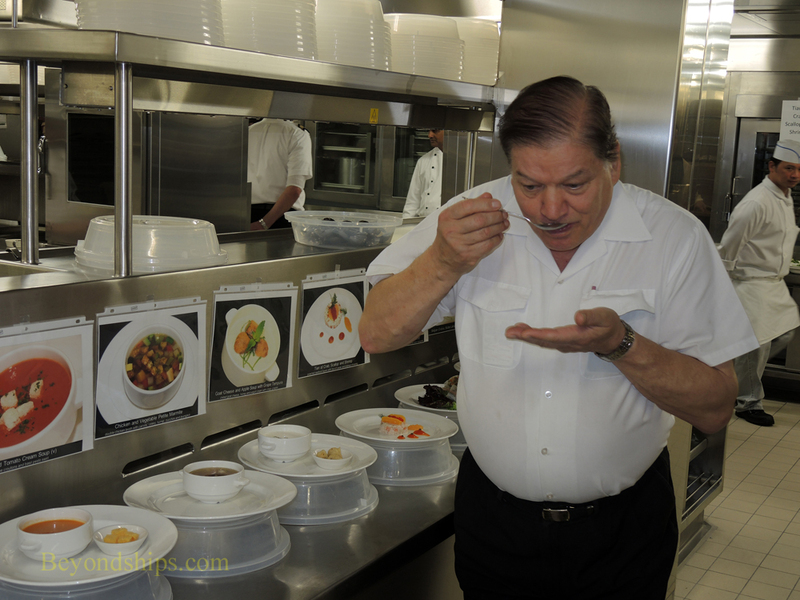 Here, Chef Marzi samples one of the dishes. The food is usually brought aboard in the embarkation port. Accordingly, in the ship's lower decks, there are vast storerooms holding literally tons of food. In addition, there are butcher shops, for meat, fish and poultry as well as bakeries, which operate 24 hours a day. Provsioning the ships this way works well but it can result in some unusual situations. For example, Princess purchases the lobsters that it serves from sources in Canada. But on a cruise to Canada out of New York, the lobsters which will be eaten in Canada are loaded aboard in New York.